We promise you expert, honest advice, prompt service and outstanding work. An Outlaw is a person who refuses to be governed by established rules or practices. A rebel, a nonconformist, bold, courageous and unafraid – and to us it means to venture forward into uncharted territory, leading the journey past the edge of the map. There are many trails to success, many routes a business may take to reach their goals. Our mission and passion, is to roam those unknown trails to help our clients navigate the vast open plains of creativity for successful design. Good graphic design is vital for a thriving brand. We exemplify the art of visual communication – the right combination of typography, visuals and layout is integral for gaining successful results. From annual reports to catalogues, stationery to posters, print is the ideal platform on which to build your image. Our various print solutions will make a positive difference to your business. Let us show you how easy it should be to own and maintain a well designed website. Whether small, large or unique – we will provide a professional solution that meets your needs. We specialise in designing and printing annual reports that represent your company in the best possible light to potential investors, stakeholders community and staff. Designing a logo is no easy task in today’s highly competitive and global environment. It takes insight, creative thinking, research analysis, experience, communication and collaboration. We believe in supporting our community and lending a hand where we can. We are proud to have been given the opportunity to provide our services to many worthwhile causes – every bit helps! We are a Ballarat based creative studio that loves to push the boundaries. With over 19 years experience, Digital Outlaw are prepared to saddle-up and roam far and wide to discover innovative solutions. We work hard at being different and aim to lasso creativity for every brand and business we work with. We’re not about playing safe, being first or following trends. We explore all directions and take pride in perfecting every detail to create meaningful design for each individual client. We’re about giving more when we could get away with less. Break the mould, partner with an outlaw. McCallum has been relying on Jamie for quality graphic design work for years, including everything from logo design, brochures, TVC and website production. His work is always of a very high standard and we can always rely on him to get the job done at short notice. His ‘can do’ attitude and friendly nature make working with him extremely hassle free. EGHS have had the pleasure of working with Jamie since 2013. He takes time to work with us to ensure he is accurately reflecting our wishes, he listens attentively and is not afraid to suggest different ways to present our ideas. His ability to reflect our aims to produce interesting documents has ensured our consumers have first-rate publications, which are readable and exciting to look at. Jamie is very patient and has a great rapport with his clients. He is great to work with and remains calm under pressure. I have no hesitation in recommending Jamie personally and professionally. We have worked with Jamie for over five years now. Jamie designed our logo which met the brief perfectly. He is always patient (which would be hard with us!) and he always has an open-mind. He always gives us sound advice and comes up with stunning designs. We think of him as an integral part of our team! I couldn’t recommend Jamie and Digital Outlaw more highly. Some clients we partner with. We are Designers. We are Crusaders. We are Outlaws. Our simple structure means you deal directly with the outlaw wrangling your job. This means nothing gets ‘lost in translation’. Jamie has been a graphic designer for over 19 years, with a wealth of knowledge and experience across all facets of design. A lifestyle change in 2013 led to the founding of Digital Outlaw - although becoming the 'leader' of his own gang was not on the radar, it is a move that has proven successful both personally and professionally, and continues to thrive today. 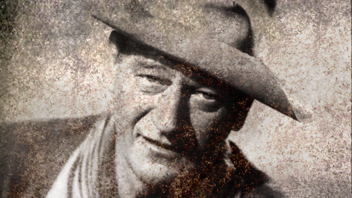 The Duke was an endearing cowboy icon that epitomised the values of Digital Outlaw: a “can-do” spirit, authenticity, courage, strength of character, humbleness, chivalry, and heart which lead to personal and professional fulfillment. A quote by the Duke that Digital Outlaw lives by “Courage is being scared to death... and saddling up anyway”. 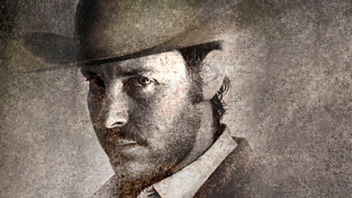 Better known as 'Billy the Kid' he is probably the most misunderstood historical figure of the Old West. He was not a cold-blooded killer, nor was he a robber of trains or banks. 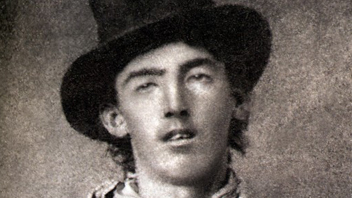 Instead he was a rustler and gunfighter caught in the middle of a feud. Billy lived a short and colourful life but made a lasting impression, which is what Digital Outlaw is all about. We are a Ballarat based creative studio that loves to push the boundaries and break the mould. With over 19 years experience, Digital Outlaw is not about playing safe, being first or following trends. We’re about perfecting every detail, exploring all directions and raising the bar to create meaningful design with successful solutions. Graphic Design, Website Design, Print Design, Annual Reports, Branding, Creative Solutions. © Copyright Digital Outlaw 2019. All rights reserved.